Molly Potter has been at MIT for 48 years. In 1967, she accepted the position of Lecturer in Urban Studies and Planning and in 1970 was promoted to Associate Professor. In 1975, Hans-Lukas Teuber invited her to join the Psychology Department (now Brain and Cognitive Sciences), and she has held the rank of Professor since 1982. Professor Potter's research has focused on very short-term memory for pictures, words, and scenes, and she has received international acclaim for introducing the RSVP paradigm. RSVP stands for Rapid Serial Visual Presentation, and the method has been harnessed to examine the earliest levels of information processing in humans. 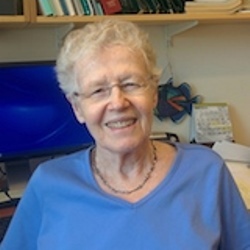 In addition to her intellectual pursuits, Potter was Chair of the MIT Faculty from 1985 to 1987, and she served on the Committee of Women Faculty in the School of Science from 1994 to 1998. The overall goal of research in the Potter laboratory is to understand the very rapid processes involved in perceiving, comprehending, and remembering meaningful material such as words, sentences, or pictures. In contemporary theories of human information processing, such material passes through several stages of analysis as it is perceived and understood, and it is these stages and their interactions that we investigate. A key discovery is that understanding the meaning of a pictured scene or written word happens in a fraction of a second, much faster than the time required for stabilizing even a brief memory of that stimulus. The viewer may not even become conscious of the stimulus unless it fits in with the context. For example, the lab has shown that a sentence can be understood and remembered when presented as rapidly as 12 words per second (using RSVP, rapid serial visual presentation). In contrast, a sequence of unrelated words (even if no longer than 4 or 5 words) is much more difficult to process and only two or three are remembered. Similarly, viewers can pick out a target picture from a rapid sequence when given a title such as "a picnic," although they cannot remember most of the pictures they have just seen. In recent work we have found, however, that memory for the pictures persists briefly, consistent with the idea that there is a conceptual short term memory (CSTM) for meaningful material. We also study competition for attention using words and other visual stimuli. When the viewer is looking for two targets in a stream of nontargets presented at 10/s, detection of the second target is markedly impaired when it arrives 200-500 ms after the first target, an attentional blink. In contrast, when the task is to report all the items on a short list, there is no evidence of an attentional blink. We have supported and extended a computational model of attention (e.g., Wyble, Bowman, & Potter 2009). Current work looks more closely at how reading a rapid sentence and picking out two targets in the sentence tap distinct forms of processing. The lab's work also encompasses other questions about perception, attention, memory, and language processing, including repetition blindness, the creative misperception of a nonword as influenced by semantic context, cross-modal (visual-auditory) processing of sentences, and the conceptual basis of "verbatim" recall of sentences. These studies contribute to our understanding of how a stimulus such as a word, sentence, or picture generates an interpretation and a fleeting or stable memory. Potter, M.C., Wyble, B., Hagmann, C.E., & McCourt, E.S. (2014). Detecting meaning in RSVP at 13 ms per picture. Attention, Perception, and Psychophysics. Potter, M. C., & Fox, L. F. (2009). Detecting and remembering simultaneous pictures in RSVP. Journal of Experimental Psychology: Human Perception and Performance, 35, 28-38. Meng, M., & Potter, M. C. (2008). Detecting and remembering pictures with and without visual noise. Journal of Vision, 30, 8(9):7, 1-10 . Potter, M. C., Staub, A., & O'Connor, D. H. (2004). Pictorial and conceptual representation of glimpsed pictures. Journal of Experimental Psychology: Human Perception and Performance, 30, 478-489.